TULSA, OK—Saturday night was truly a night where Murphy’s Law played havoc with the Oklahoma Defenders football team. The Defenders (2-2) hosted the Sioux City Bandits (2-1) for the first time in two years on Saturday night in the Cox Business Center. 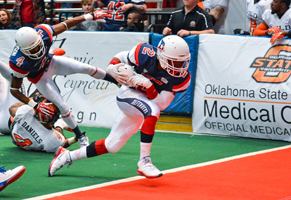 The Defenders were coming off a game where the CPIFL’s defending champions edged them by six points last Sunday, and the Bandits came to Tulsa after trouncing Lincoln 68-17 on March 8th. If it could have gone wrong for the home team, it went wrong. The Defenders offense seemed out of sync, there was blown coverage on defense, and the guys in the black-and-white striped shirts were of little help. Defenders quarterback Brady May, in his second start, threw two interceptions that led to Sioux City points in an abysmal second quarter that saw the Bandits enter the Defenders end zone four times. While things were not working in the Defender’s favor, it wasn’t all bad. The reigning CPIFL Rookie of the Year Patrick “Packy” Jones caught two touchdown passes, while Jamario Thomas and Isaiah Anderson caught one each. A scoring drive that ended the first half saw Ronnell Lewis plow his way into the Sioux City endzone William “Refrigerator” Perry style. All that was well and good but the Defenders could not get any closer than a 7-7 tie early on in the game. While shaky with the two picks, quarterback Brady May performed admirably, completing 13 of 31 passes for 174 yards and three touchdowns. Defensively the Defenders managed to have Ronnell Lewis lead the team with seven tackles and Victor Clore and Michael Billingsley registered a sack on Bandits quarterback Scott Jensen. The officials in the game had questionable control over the game, as many of the signals coming from the guys in stripes were conflicting…including what was an apparent two-point conversion where the official nearest to Packy Jones signaled that the conversion was good and the far side line judge signaled no good. Two flags on the Defenders mascot Billie The Regulators rounded out what had become a nightmare in terms of officiating a football game. Jensen made up for those mistakes by being nearly perfect to receivers Eddie Pertilla and Fredrick Bruno, who caught four passes each and scored two touchdowns each. All of Sioux City’s touchdowns were scored through the air, and they registered a safety after a holding call to the Defenders in the end zone late in the game, and kicker Braden Wieking connected on three-of-five field goal attempts. Tickets for the next Oklahoma Defenders home game against Bloomington, as well as the remainder of the Defenders home schedule are on sale at the Cox Business Center box office and further information for group rates and suite rentals are available at the Defenders website (www.oklahomadefenders.com) or by calling 918-403-9926 918-403-9926. This entry was posted in Sports on March 24, 2014 by admin.